Anyone who's been thinking about remodeling or creating a kitchen for more than 10 minutes has come across the term "transitional." It's a popular term in design circles, but what does it really mean? Transitional designs are somewhere in between traditional and modern styles; they bridge the gap between the two, borrowing from each aesthetic. What it yields is an environment that is warm and welcoming, unfussy but incorporating classic components . Most of my designs would be described as transitional: some read very modern, others more traditional -- and yet they are all wildly different from each other. So while almost everything is up for negotiation when designing a transitional kitchen, here are some of the style's hallmarks, as well as some examples of how I've interpreted the look recently. Perhaps the cornerstone of the style. 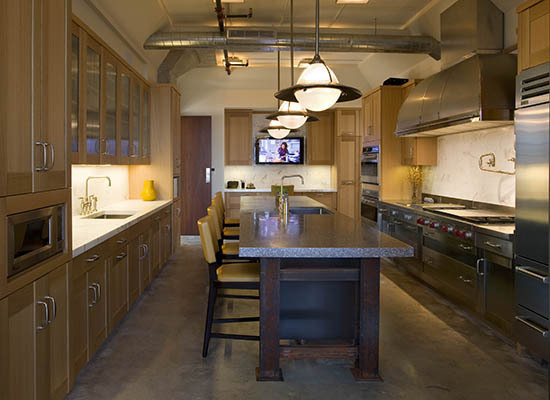 A transitional kitchen will often feature wood, steel, glass and stone or marble all in the same space. This is a kitchen I designed for a Tribeca loft space; you can see wood cabinets, concrete floors, marble, and stainless steel working together to create a harmonious whole. I wanted the space to reference the building's industrial history, while also maintaining a sense of warmth. A pop of color here or there is certainly welcome, but in general, transitional kitchens feature neutral colors in varying shades. The result is typically a sophisticated, and timeless look. A good example of this is the kitchen I designed for a Florida high-rise, which features different tones of brown in the floor, island, cabinetry, and furnishings. While transitional kitchens are often subdued when it comes to color, that doesn't mean they're boring at all! Transitional kitchens are often delightful explorations of texture, using everything from interesting tile surfaces to polished or rough stone to provide visual interest. Cabinetry in transitional kitchens tends to keep a low profile. You won't find a lot of intricate carving, or elaborate hardware on transitional cabinetry. What keeps it from looking too modern, is the material: I typically use wood as opposed to glass or lacquer to keep it transitional. This kitchen, which was designed for a Pre-war high-rise, features minimalist cabinetry in a warm rich wood with recessed handles. I love how the clean lines and the natural material balance each other out, creating an uncluttered but still inviting effect. In the broadest sense, this is the definition of a transitional design. A transitional kitchen borrows elements or references styles of the past and combines them with contemporary features to produce something new and fresh. The beauty of it is that you can decide how you want to mix and match the past and the present so that it's a kitchen truly expressing who you are and how you live!